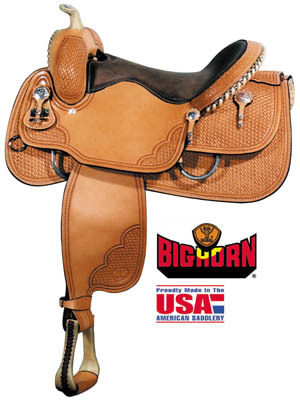 Big Horn Reining Saddle with antiqued steel conchos and rigging dees, tooled and silver wrapped rawhide cantle. Tree: Double fiberglass covered wood tree with full quarter horse bars..
Seat: 16" center balanced grain out, padded. Horn: Leather wrapped reining horn 2 1/4" x 2". Rigging: In-skirt 7/8, antique steel D.
Skirts: 28 1/2" x 14 1/2"
Fenders: 18 1/2" x 7 1/2"
Trim: Basket stamped tooling with antique steel conchos and rigging dees.